Learn the massage steps with this baby massage video YouTube. You can then practice them on a teddy bear. Please read all the routines given in the guide below so you can confidently massage you baby. An important aspect of baby massage is to know when not to massage! Never massage the baby when it is not well or when it has just had an immunization. Some babies also have very sensitive skin; so avoid massaging if it has a rash or eczema. As a parent, you are equipped with all the instincts you need for the massage. Never massage when the baby is sleepy and do not try to force the movements. Many doctors advise not to bathe or massage newborns in the first few days after birth. So always discuss with your doctor first about when to start newborn massage. The choice of the massage oil or medium is entirely up to you. Most vegetable and fruit oils are good for baby skin. Oils like coconut, olive, sesame, and jojoba oils work well. You can also add some essential oils to these carrier oils. Always perform a patch test of the oil first, before performing the baby massage for sleep. Apply a bit of the oil on baby’s arm and wait for 24 hours. If no reaction occurs, it is safe to use the oil on baby’s tummy for gas relief. Avoid products containing fragrances and dyes which could lead to allergies on the baby’s skin. Choose the right time and place for the massage. You can start baby massage when the baby has just napped and is not too hungry or when it is in a playful mood. 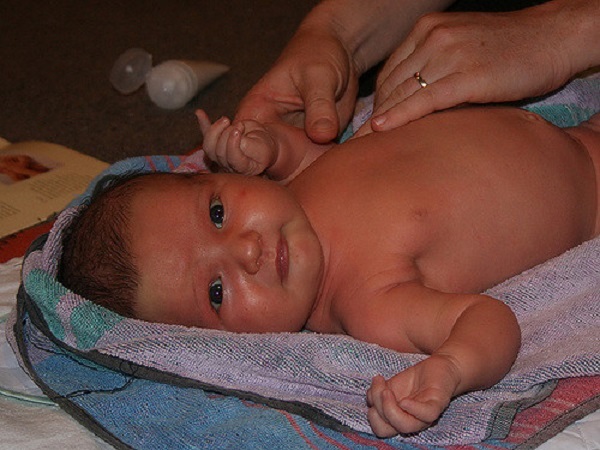 The best place for a baby massage is on a towel on the floor (or on a table or a changing station). Make sure that the baby will not fall if you massage it on a table. Prepare for the massage by keeping all the items you need handy such as the oil or massage lotion, extra towels, wipes and tissues etc. Only once you have assembled all these should you undress the baby. Make the baby massage a fun routine. Sing or talk to the baby during the massage so that you can bond with it. With regular practice, you and your baby will love this special time together. Be confident as you massage and always start with gentle movements. Start by massaging the baby’s legs. Stroke gently along their lenght as you apply the oil over both the legs from thigh to the feet. Milk the hand repeatedly over the leg and also perform 2-finger circular strokes on the calves. Use your thumb to circle up gradually from either side of the shin bone and glide back and forth on the leg. Repeat with both legs. Gently bend the leg at the knee and massage the entire thigh. Do not force any movement. Keep an eye on the baby to see if it is enjoying the massage. Stop if the baby shows signs of pain or distress. This is a great routine to include in baby massage to reduce gas and colic. Clap both the feet together and gently rock the baby from side to side. Babies love having their feet massaged. Gently stroke the foot hand over hand. Don’t forget to massage between the toes. Baby tummy massage can relieve constipation and colic. Perform this massage in large circles with fingers around the sides of the stomach and under ribcage. For deeper massage if baby has gas or colic, perform a 2-finger massage above the navel in form of a ‘rectangle’. Glide up the chest and over the shoulders. Stretch baby’s arms out and glide over both arms from shoulder to palms. Cross baby’s arms over the chest and also stretch them above baby’s head. Gently turn baby on the stomach. Glide your hands all over the baby’s back, thighs, legs and buttocks. Massage the feet again. The routine given here is just intended as a guide. Change it as needed and lengthen or shorten the duration depending on how much time you have as well as your baby’s mood. Enjoy the special time together that the massage gives you and your baby!